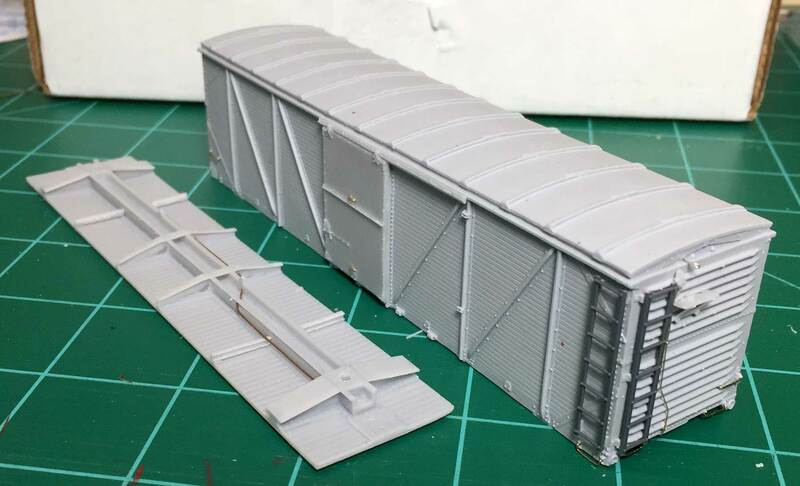 Pete Hall shared a couple images of boxcars that have recently been painted and lettered. Here’s Pete with some notes from his workbench. I’ve been using tiny pieces of decal from the Microscale Data for Diesels – Black and White set # 87-48 to make placards. There are several black-and-white decals intended to be put on the frames of diesels that I am cutting into 3×5 or 4×7 “cards” and attaching to the wood doors or the tack boards of cars. The white background and not-legible black writing looks like what you might see on a card tacked to a car. The car above is not quite finished. It has been decaled but not over sprayed.